When to Use a Put Option Ratio Spread in Commodity Trading? 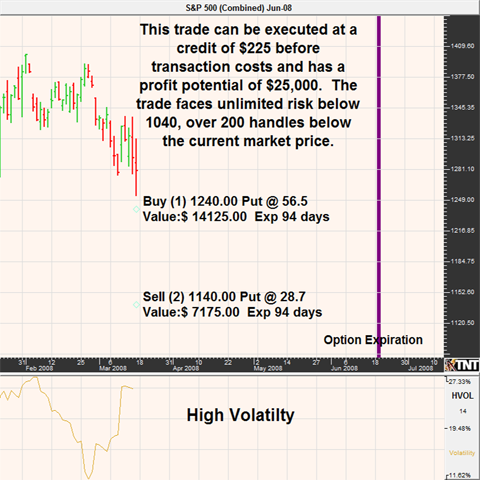 The objective is to put this trade on as a credit, a free trade or very cheap. This occurs when a trader collects more premium for the short options that is put forth for the long options. Free does not entail a lack of transaction costs, margin or risk. What is the Risk of a Commodity Put Ratio Option Spread? In my opinion, one of the most opportune markets to employ a put ratio spread strategy in is the stock indices. During times of excessive volatility, it is possible to construct a very large spread which translates into a large profit zone, at very little cost or possibly even a net credit. During my time as a futures broker, I have often recommended that such trades be used as a hedge against naked short put options that are experiencing losses due to increases in volatility and price movement. Although, such trades can also be executed as a purely speculative play and without any relation to existing trades. In mid-March of 2008, equities were struggling and market volatility was extremely high; as a result, put premiums were at top dollar. Based on Black and Scholes pricing, it would have been possible to purchase a June 1240 put and sell 2 June 1140 puts for a net credit of 90 cents in premium or $225. This is figured by netting the premium collected (57.40 - 56.50) and multiplying by $250 which is the multiplier for the S&P. This strategy could also be employed using the mini version of the options, but would involve one fifth of the premium, profit potential and risk. Assuming fills as the prices noted above, the trade is capable of making money anywhere above the reverse breakeven point. This is because the trader gets to keep the premium collected even if the market rallies in the opposite direction of the spread. The maximum profit occurs if the futures price is at 1140 at expiration, this is because at that point the two short options will expire worthless and the long option will be worth the difference between the long and short options or $25,000. Don't forget about the $225 originally collected to make the total maximum profit on the trade $25,225 before commissions and fees. The risk of loss on this futures trading strategy is unlimited, but occurs well below the current market price giving traders a tremendous amount of room for error. Unlimited risk can be found below the reverse breakeven point or 1039.10, this is figured by subtracting the amount of premium collected from the point which is equidistant to the short puts as the long put is to the short put (1040 - .90). In essence, this trade makes money as the market drops below the strike price of the long put and approaches the strike price of the short puts. Once the short put strikes are surpassed, the trade is giving back profits until running out of money at 1040 without regard to the premium collected and the transaction costs paid.